John Specker is a Vermont-based fiddler credited with pioneering the “Ithaca sound” in the 1970s as a member of the Correctone Stringband, a group that fused old-time music with reggae and African grooves. Alongside his daughters, Lila and Ida Mae Specker, John’s family band, the Speckers, has been barnstorming stages around the Green Mountains for years, playing a rambunctious version of old-time music that owes as much to punk rock as Appalachia, at least in attitude. On her debut solo record, Single Girl, Ida Mae Specker reveals she’s taken dear old dad’s lessons to heart. She delivers a rowdy collection of Americana fiddle staples that, in terms of raw energy, stand about a country mile from the majority of bluegrass and old-time releases in Vermont. Much like her father, Ida Mae Specker is a profoundly gifted and technically sound fiddler. Her multifaceted bowing technique is particularly impressive. But, also like her father, she’s not one to let academics get in the way of a good time — Brown University education be damned. There might be more immaculate fiddle players in Vermont. But you’d be hard-pressed to find a more gleefully enthusiastic one, at least outside her own family. Specker opens with a rousing take on “Red Rocking Chair.” In Specker’s hands, the bluegrass standard comes alive with frisky, wild-eyed energy. That trend holds through much of the record, especially on hair-raising, foot-stomping cuts such as “Let Me Fall,” “Cripple Creek,” “Plank Road” and the title track. Even in comparatively quieter moments, such as on “Morning Blues,” Specker employs a visceral, woozy grit that suggests she’s more comfortable in a rural grange hall than she would be at the Grand Ole Opry. That’s a compliment, and a testament to both her record’s genuine, down-home appeal and the way she manages to make time-worn classics seems like they were written just for her. For example, many listeners probably can’t hear “In the Pines” now without thinking of Nirvana, let alone the early Leadbelly or Bill Monroe versions. Somehow, Specker twists that dour classic into a fresh but equally gloomy direction that stands apart from more famous takes. Ida Mae Specker dedicated Single Girl to her dad, and included some of his fatherly advice in a quote on the CD jacket’s back panel. It’s a take on ages-old backwoods witticism that reads, “Born on a mountain, raised in a cave. Fiddling fun is all I crave.” And those words just about sum it up. 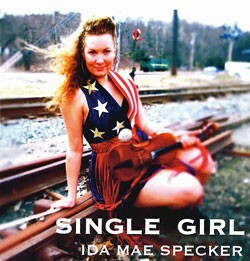 Single Girl by Ida Mae Specker is available at thespeckers.com.